Remember Jeph Loeb and Tim Sale? Yeh. The same duo that gave birth to The Long Halloween. The dynamic duo — no, I’m not talking about Batman and Robin — also teamed up a couple of times for more brilliant, sometimes very creepy, stories for the great Dark Knight. 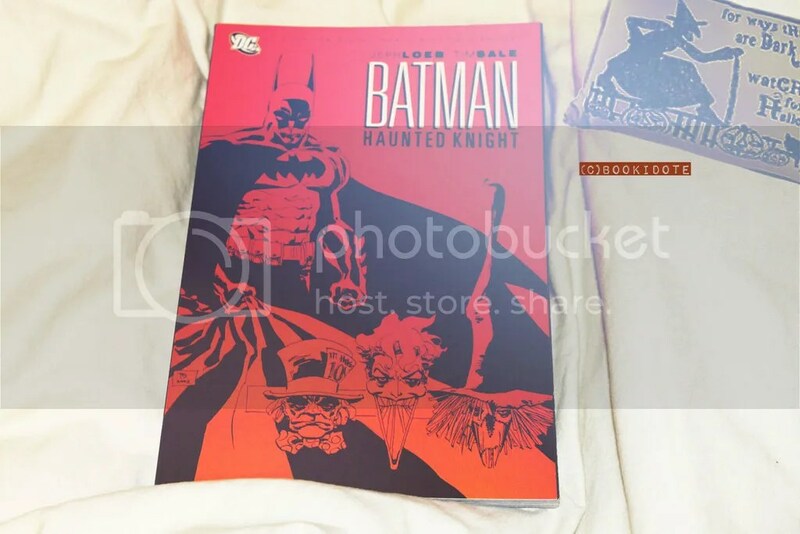 Batman: Haunted Knight is a trade paperback containing three one-shot stories that these two writer and artist released every year before 1996. Without having any huge story impacts on both classic masterpieces The Long Halloween and Dark Victory, readers get to enjoy some of their favorite villains as they try to wreak havoc on Gotham and teach Batman some interesting lessons. Fears, the first one-shot story, has Scarecrow going up against Batman. Will it be his last straw? Madness introduces the very-known character of Barbara Gordon, daughter of James Gordon. 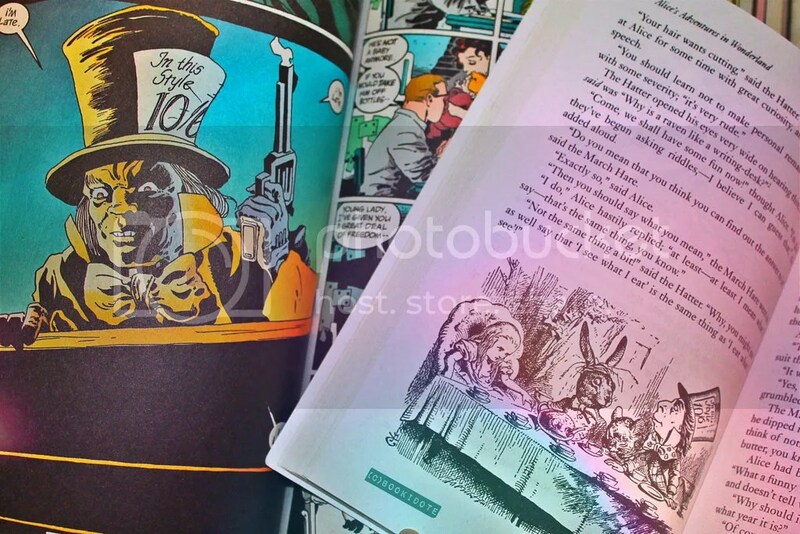 It also has none other than the Mad Hatter showing off his most insane and disillusioned self in, probably, the best one-shot tale in this collection. Ghosts puts forth an alternative version of the famous Christmas Carol as Bruce Wayne encounters other famous villains we all grew to love and hate. The dark, sharp and eerie artwork returns with just as much strength in this trade paperback. As you read through each story, you can see and feel the evolution in the art. It’s really enjoyable when you see how they explore Batman and illustrate him in The Haunted Knight. Gotham couldn’t have looked more like a wreck and Batman couldn’t have solicited more empathy from readers. The first story does a great job on playing on fear. As we all might know, fear is one of Batman’s greatest weapon. He embodies it and treats criminal of what they spread in Gotham. As the story unfolds, we see how Bruce faces fear and what he does to overcome it. The second story portrays madness thoroughly. The Mad Hatter was a perfect choice for this, even though some might think Joker could’ve been just as great of a choice, or even better. In fact, Matter brought a gloomy atmosphere through his madness and rotten plans. He also manages to add a pinch of insanity through colors. The plot also manages to capture James Gordon’s struggle to rid Gotham of the crime it generates while being a father. Loved the fact that we also get to see one of Barbara Gordon’s first appearances. Although she doesn’t do much, she sure is an important character in this tale. The last story, Ghosts, could’ve used some more work as I wasn’t as thrilled compared to the first stories. Penguin might have been the root cause of this with his pretty lame escape. The story wasn’t as great either since the ghosts did not teach us much that we didn’t already know about Bruce Wayne. This sure could’ve used some extra panels to give more spotlight for the ghosts and less on Penguin. Rather short and somewhat soothing to see these two legends back at work, The Haunted Knight explores fear, madness and ghosts rather well. 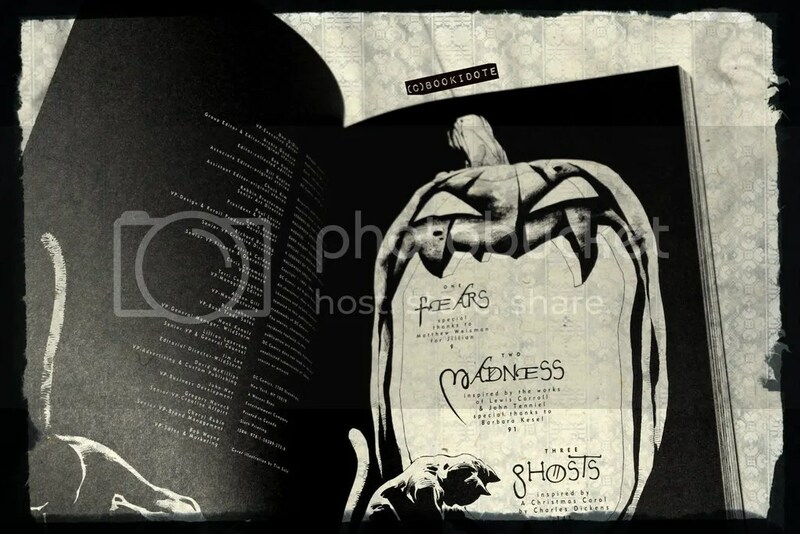 Madness being my personal favorite in the collection, I can’t forget to share my feeling of excitement and satisfaction for the ending of that chapter. SPOILER HERE: Hover over text to read. I always found the references in Batman to classic literature really interesting. This collection isn’t short on those. It was sad but pleasant to see young Bruce Wayne in a nice little costume to foresight a near future. A rather tragic future. The Alice In Wonderland references where also a nice touch. Although, it was also very inevitable since The Mad Hatter and his world always come in pair. Jeph Loeb and Tim sale still do a great job in squeezing in that universe into Batman’s. They also successfully use that to their advantage in order to depict a more disturbed Hatter. Doesn’t it raise the littlest hair on your skin to know a tiny big-hatted fellow kidnaps children only to fulfill his little fantasy of a timeless tea party? Gosh, I had me with big-hatted. This collection of stories doesn’t measure up to what the two other projects Jeph Loeb and Tim Sale worked on. Nevertheless, it was still a fun read. This collection gives reader a great opportunity to see some short adventures of Batman’s debut as the caped crusader. It’s always nice and refreshing to revisit the duo’s work together. It’s also an interesting fact that Christopher Nolan took a sip of Haunted Knight in Batman Begins. That last quote was actually in the movie, if you recall ! As always, don’t forget to share your thoughts on this trade paperback, as well as like and follow us as we continue to get you guys reviews to read and enjoy. So what are you waiting for? 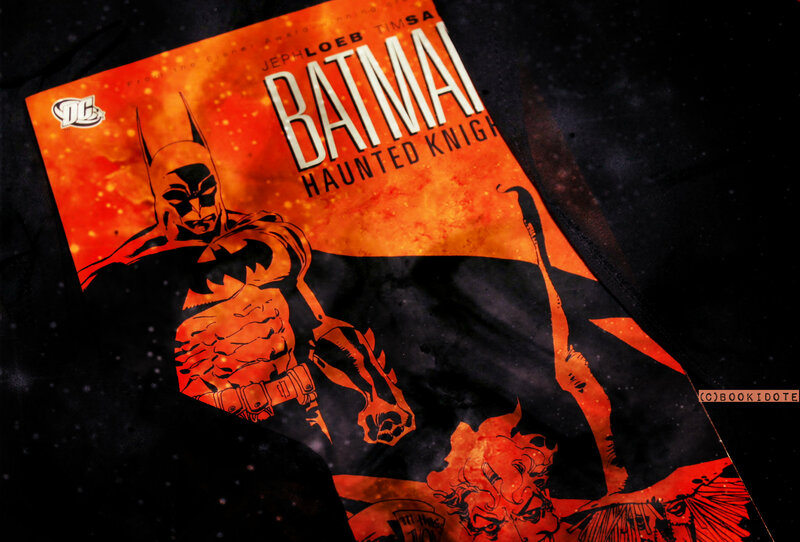 If you’re interested in this collection, you can purchase a copy of Batman: Haunted Knight by clicking on this hyperlink ! There’s so many graphic novels out there that can interest.. basically.. anyone. If we stay in Batman’s universe, I’d tell you to check Joker by Brian Azzarello, Arkham Asylum A Serious House on Serious Earth by Grant Morrison and The Dark Knight returns by Frank Miller ( I have a review for this one on the blog, you could also go check that out ! ). If you haven’t read any of those, you should check them out ! Another nice review, I’ve only read the Long Halloween but Dark Victory and Haunted Knight are on my list! Thanks a lot man. You should definitely check them out when you get the time ! Especially Dark Victory, since it has an important story arch.